So strange. I've been working on an entry for two days now and I can't get it right. It's not even that my thought is particularly profound; I just keep losing focus in my writing. Maybe it's because Marcos is home from Canada (insert Joni: "oh Ca-na-da-AAAAAAAAAAAAHHH"), and I have something much more important to focus on. So, until I get the post to a place where I'm happy with it, here's an image to tide you over. This is a wall of outlets. Marcos reads a tech-y blog that highlights strange inventions, like this one. 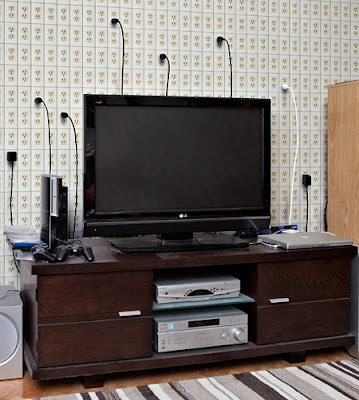 One of the blog commenters suggested that the outlets should actually be a wallpaper, with only a few real sockets here and there, to keep costs low. Brilliant. I was also thinking: I hope this dude doesn't have kids. It would be a real chore to put out those plastic socket protectors.